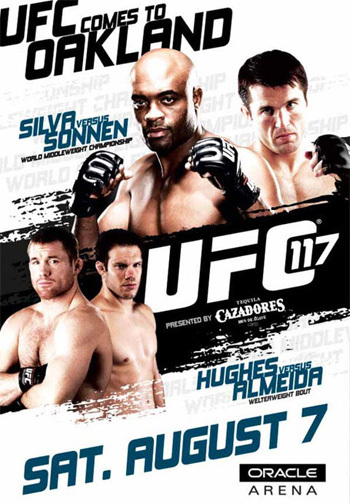 After witnessing four underdogs leave UFC 116 victorious, gambleholics worldwide have been itching for a sneak peak at the betting lines for “UFC 117: Silva vs. Sonnen” on August 7th. The pay-per-view broadcast will be jumping off inside Oracle Arena in Oakland, California. Controversial middleweight champ Anderson Silva will defend his strap against Chael Sonnen in the event’s featured contest. The bitter rivals will throw down in OakTown to determine who the planet’s top 185-pounder is. When challenged, MMA’s deadliest assassin has displayed a vicious arsenal that’s sent most into unconsciousness. Unfortunately, fans haven’t witnessed “The Spider” unleash his webs in quite some time. Sonnen has promised that a new king will be crowned if Silva doesn’t return to form. “I REALLY like Thiago Alves at -130,” the all-mighty Ngo-stradamus stated.